I love old fashioned telephones. My Dad worked for Telstra (formerly Telecom) for I think over 30 years so there were always a few old telephones around the house to play with when we were kids. 1. Wooden Dial Telephone Christmas Decoration from Sniffleco Sure it's a Christmas decoration but I reckon you could hang it anywhere anytime for a bit of retro chic. And, if you're in Brisbane and you want to do some 'real time' handmade shopping head to the Young Designers Market at Southbank tomorrow (Sunday). ok, that David Bowie phone call was hilarious! Thanks for the laugh! I do so love old style phones too... if only I had a need for a land line instead of just my cell phone. We have an old bakelite phone in one of our upstairs bedrooms that came with the house (circa 1900)...works too! It takes forever to dial if someone has more than one zero in the number! Love it and since it is a permanent hookup, it will never leave the house! southbank sounds like fun, just wish i didnt have kids to drag around... in a few more years they could have play dates while i go playing too :) love your saturday shopping list it always makes me smile. I'm going to have to have that IPhone holder one day when I get an IPhone. Thanks for sharing fabulous links as always. 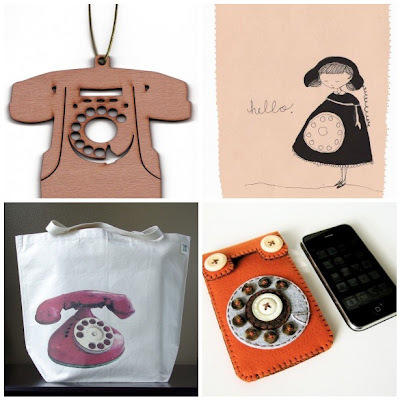 Beautiful collection of telephone creations. Ha ha!!! That's a great way to start a Monday, with a giggle. Thanks for that , Rebecca - love the operator when she cracks up. To the matter in hand...fab finds! every week. without fail.